Performers include: Karl Malden, Michael Douglas, Reuben Collins, and Richard Hatch. A pair of police officers investigate homicides in the City by the Bay. Lieutenant Mike Stone (Karl Malden) is a widower and a 20-year veteran of the San Francisco Police Department. His partner, Assistant Inspector Steve Keller (Michael Douglas), is a young college graduate with no prior police experience. Stone acts as a second father to Keller as he learns the procedures of investigative work. Keller is eventually promoted to full Inspector and later takes a teaching position at a local college. In later episodes, Stone is partnered with another young Inspector by the name of Dan Robbins (Richard Hatch). Stone (Karl Malden) and Robbins (Richard Hatch) pursue a cruise ship jewel smuggler who’s trying to locate a dog collar that’s made from stolen diamonds. First aired: June 9, 1977. On January 27, 1992, NBC aired a TV movie called Back to the Streets of San Francisco. 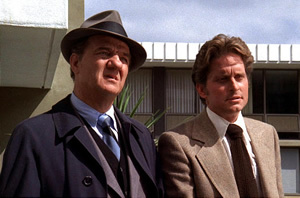 Karl Malden returned as Stone, who is now the Captain of Inspectors. He works with two young lieutenants; the daughter of a judge (William Daniels), hard-nosed Sarah Burns (Debrah Farentino) and the son of a cop, family man David O’Connor (Conor O’Farrell). Stone must decide which one of the two he wants to promote to full Inspector. His old partner, Steve Keller, is a criminology professor who is married to another professor, Anne (Lorri Holt). When Keller misses a dinner date and goes missing, Stone fears the worst. A felon that Stone and Keller locked up years earlier, Carl Murchinson (Nick Scoggin), is out on parole and has strangled Keller out of revenge. After the funeral, Murchinson kidnaps Stone’s adult daughter, Jeannie (Darleen Carr), to lure Stone into a trap. Thankfully, the veteran cop is able to save the day. In July 2008, CBS commissioned a script for a revival of the series with a new cast. • Malden and Carr were the only two series castmembers to return for the “reunion” movie. Ed Vasgersian, “Sergeant Pasarella” in the movie, played two unrelated characters in the series. • When asked if Douglas had been approached about taking part in the reunion movie, Malden said that he didn’t call his movie star friend because he didn’t want to put him in the uncomfortable position of having to turn it down. • The series was nominated for 16 Emmys during its five year run. Four nominations went to Malden and three went to Douglas. Unfortunately, neither the series, cast, or crew won. • The recurring character of Officer “Monkey” Sekulovich (Art Metrano) occasionally did legwork for Stone. “Sekulovich” is Malden’s real surname and the actor tries to get it included in his projects. He died off-camera in the Back to the Streets of San Francisco TV movie from 1992. Detective Mike Stone and partner Inspector Steve Keller drive a 1971 Ford Galaxie 500 and Inspector Dan Robbins drive a 1976 Ford LTD 4 door sedans in the show played by Karl Malden,Michael Douglas and Richard Hatch. on the set of The Streets on San Francisco they have a 1972 Ford Custom 500 police and a 1971 Ford Galaxie 500 unmarked car.